Waterways Lock or abriviated to lock, is probably the most common activity practiced as part of traveling on the British inland water ways. 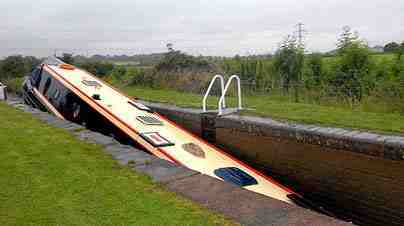 Some are manned by the CRT or the EA when there are large powered locks for example. These occur on the large rivers like the Trent near to Newark. The first question is what is a lock? A Locks is a system used to lift or lower boats from one level to another. They are found on almost all canals and rivers in the UK. A lock is found when you get a section of canal or river that is required to have either a higher or lower level. The lock uses closed off by gates which control the water level so that boats can be raised or lowered as they pass through it. I have heard the term flight, what is a flight of locks? These locks resemble a flight of stairs – they consists of a number of locks (or steps) one after another. Sometimes however there can be a stretch of canal between one lock and the next, or they can be one after another. These locks are so close together that the top gates of one and the bottom gates of the next are one and the same, this is what is called a staircase flight. A manned lock, what is? Like the question suggests these locks are manned by a lock keeper. Busier locks on the Canal & River Trust's navigational routes have locks which are manned and operated for you during the summer months. You can contact these lock keepers by VHF radio if you have that facility onboard. How do i work a lock? If you are new to boating, and you are hiring the boat the hire boat operator will talk you thorough it before you set off. Locks are very simple and are all part of the fun of a canal holiday, great for exercise too. Most locks have two sets of gates, the top and the bottom, and a chamberbetween the top and bottom gates which your boat enters into. 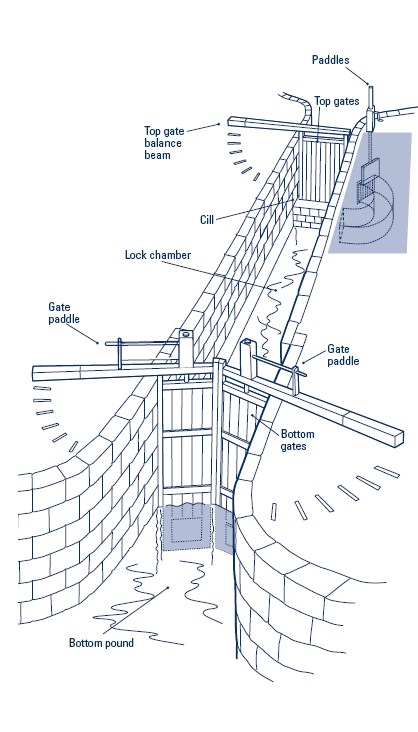 Locks also have other openings called paddles or sluice gates at the top and bottom and it is by opening these that water is allowed into and out of the chamber to raise or lower the water level which includes the boat. You and your crew will open and close the paddles using a lock handle called a windlass, which you will carry with you on your cruise. Be very careful with windlasses, as if not engaged properly can slip. If they are let go of, can spin round on thier own as the paddle trys to close. I saw this happen where a lady was hit very bady on her hands causing a break to one of her bones. SO BEWARE. 6. Always watch what is going on and ready to close the paddle or sluice gate in case something goes wrong, like someone falling in or a boat hang up. 3. The boat will lower as the water level in the lock falls. Once the boat starts going down make sure that you keep its stern away from the gates – there is often a sill underwater on which your boat can become lodged causing serious damage and on rare occasions causing it to sink. 4. Once the water level inside the lock is the same as the water level ahead in the canal, open the bottom gates and take the boat out. Water always flows downhill and lock gates are closed against the pressure of this water. The lock gates will not open until the water pressure (level) is equal on both sides. Never get near the cill this can cause a boat hang up and sink the boat. Have a pre arranged emergency signal if something is wrong to inform your crew to close paddles. Passing through a lock will generally take from 10 to 20 minutes, depending how big the lock is and whether or not it was originally set in favour of the boat (it is always pleasing to meet another boat coming towards you on the approach to a lock – this boat will have just exited the lock on your level and therefore the lock will be set for you). Just remember TAKE YOUR TIME.